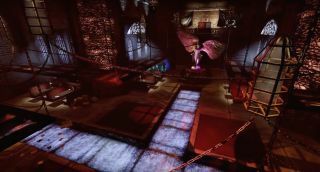 "In violent times, you shouldn't have to sell your soul…"
A bar from 2004's Vampire - The Masquerade: Bloodlines has been recreated in breathtaking detail in Killing Floor 2 as a custom map. When questioned about how long it'd taken to perfect the level, creator Synchaoz said: "As a rough estimate I'd say around 130 hours or so, including play tests. I had some pre-built sections (like the vampire tomb and parts of the backstage room) from old map projects that were cancelled, which I was able to copy/paste and just do minor modifications on, which shaved off a handful hours of work.﻿"
"The Asylum, The Last Round and Vesuvius were considered to be added as side-areas," the creator added, "but due to time and logistics I decided to stick to The Confession and instead expand it according to my own vision.﻿"
In our Killing Floor 2 review, we awarded the shooter 81, stating: "If you want a perfect replica of Killing Floor, with its specific classes and balancing, Killing Floor 2 isn’t that. But it is a visual spectacle, and a challenging, fun co-op shooter with an active mapmaking community."